Labour workers win this round at the Old City Hall. Photo courtesy the Toronto & York Region Labour Council. In today’s all-free edition of Urban Planner: learn why nine-to-five is a blessing, how Impressionism differs from Romanticism, the signs of ovarian cancer, and what all those film critics are raving about. WALK: George Brown College, the Toronto & York Region Labour Council, and CUPE Local 79 want you to get moving—a slow walk will do—at their launch of “Toronto Labour History Walking Tours.” Learn the battles of labourers (including the win of a mere nine-hour day, yikes) in one of three distinct eras: 19th Century Toronto begins hogtown’s working history, Early 20th Century Toronto explores the city’s industrial growth, and Post-War Toronto carries us from WWII to right now. 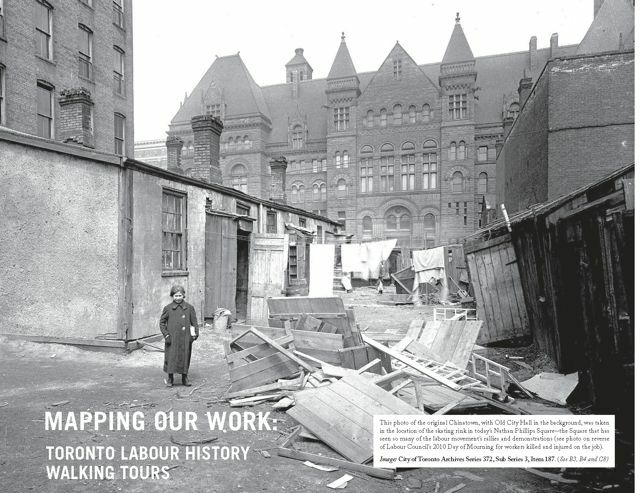 Launching from George Brown College and concluding at St. Lawrence Hall, speakers include map co-authors Maureen Hynes and David Kidd, Toronto & York Region Labour President John Cartwright, historian Craig Heron, and more. Foyer at George Brown College (200 King Street East), 10 a.m., FREE. ART: Two hundred institutions worldwide, including the Art Gallery of Ontario, are participating in Ask a Curator Day—a live “event” (it’s on Twitter, natch) where twitterers can ask their most pressing art questions: what’s Dada and how do I get one? Is Mona Lisa really a man? What’s the difference between avant-garde and art nouveau? And what makes that modernist red line so damn special? Fire away to the general hashtag #askacurator or right to the AGO, where Michelle Jacques, associate curator of contemporary art, and Sophie Hackett, assistant curator of photography, finally explain how romanticism differs from realism. Also ask your general curating questions or about the AGO itself or whether Frank Gehry is a one-trick pony. Get artistic already. www.twitter.com, 11 a.m.–12 p.m. (Jacques) and 3–4 p.m. (Hackett), FREE. CHARITY/SIGNING: To kick off Ovarian Cancer Awareness Month, everyone’s favourite bargain paradise, more commonly called Winners, is hosting Olympic Silver Medalist Elizabeth Manley at College Park. Since losing her mother to the disease, Manley has become a national spokesperson for Winners Walk of Hope, bringing awareness of signs and symptoms, as well as some much-needed publicity to Canada’s most fatal gynecologic cancer. Get out there and show your support for the 17,500 Canadian ladies who need it. Winners College Park (444 Yonge Street), 12–2 p.m., FREE. FILM: Final curtain call, folks: Summer Movie Nights, the Entertainment District in partnership with TIFF’s free Wednesday flicks, wrap up another summer with tonight’s screening of Casablanca. You know, love affair with Ingrid Bergman plus Humphrey Bogart, beautiful friendships, and playing it again, Sam. What? Haven’t seen it? Well, miss tonight and you’ll regret it. Maybe not today or tomorrow (when it’ll play if it rains out tonight), but soon and for the rest of your life. Metro Square (King & John streets), 9 p.m., FREE.